Ginseng Cola and Watermelon Beer? I don’t consider myself a connoisseur of soft drinks (or anything for that matter), but every so often I am tempted to try something and yap about it on here as if I know what I am talking about. Sort of like my annual Autumn beer review. While it is fun to get a buzz and carve Jack-O-Lantern faces in various items, the review should not be taken as a serious beer taste-test. I just needed a vessel for my shenanigans. So here is a quick article that will fill my time off as a facade for being productive. Tonight, I am going to review a few items that I picked up at the local Food Co-Op. 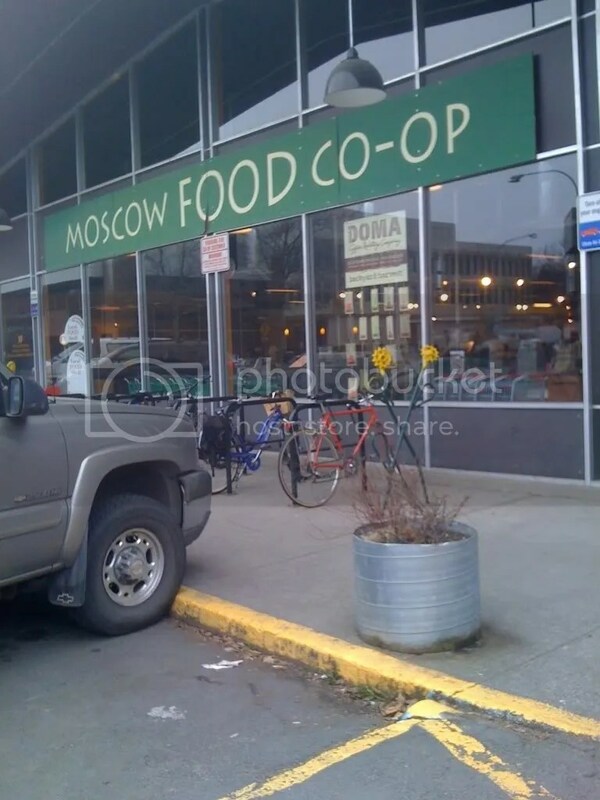 To me, the Food Co-Op of Moscow, Idaho is a slice of heaven. There are so many international items, odd vegetables, organic anythings and hundreds of micro brews in the beer aisle that to shop there is less of a chore and more of a trip. Sure there are some die-hard organic-loving hippies but for the most part, there are people like me who just want to load the cart with oddities and spend $1.30 on a root beer. Maybe I am the weird one and the hippies are normal? Hmmm. No, I smell much better. 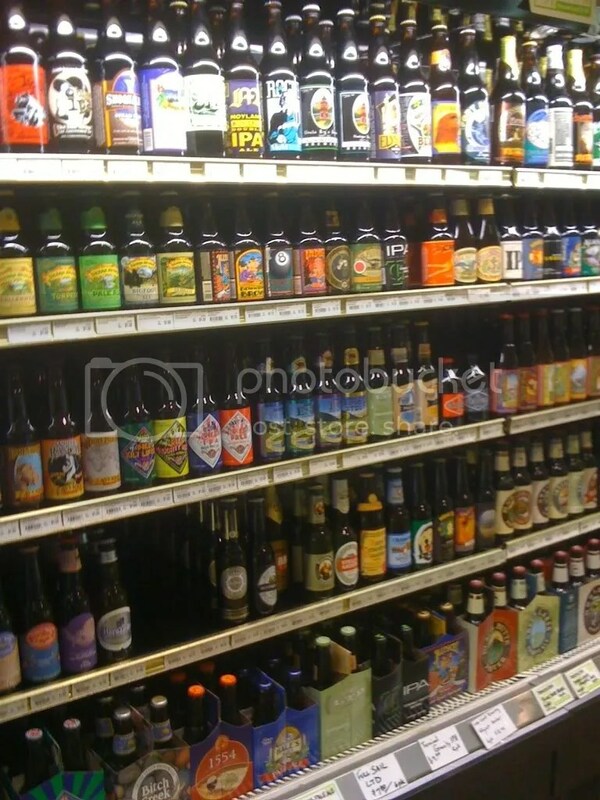 As you can see, the selection of the beer and sodas from around the US and world is pretty extensive. The really cool thing is the box full of old 6 pack holsters so you can create your own beer box of goodness. 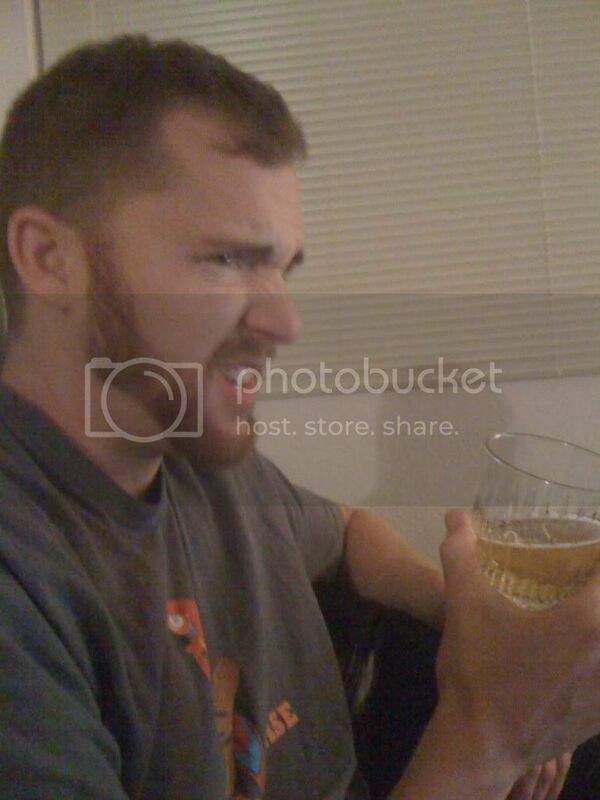 As a person who has an average appreciation for fine beer, much is wasted on me because one man’s heavenly nectar is another man’s bottle of yak piss and if it is less than pleasing, I have a habit of making this face. So, don’t expect me to be agreeable over a $10 bottle of beer when I am the type that has recently ordered a Happy Meal and an orange soda. But I did end up with a few gems and here they are. Lola was promised a part in this review. 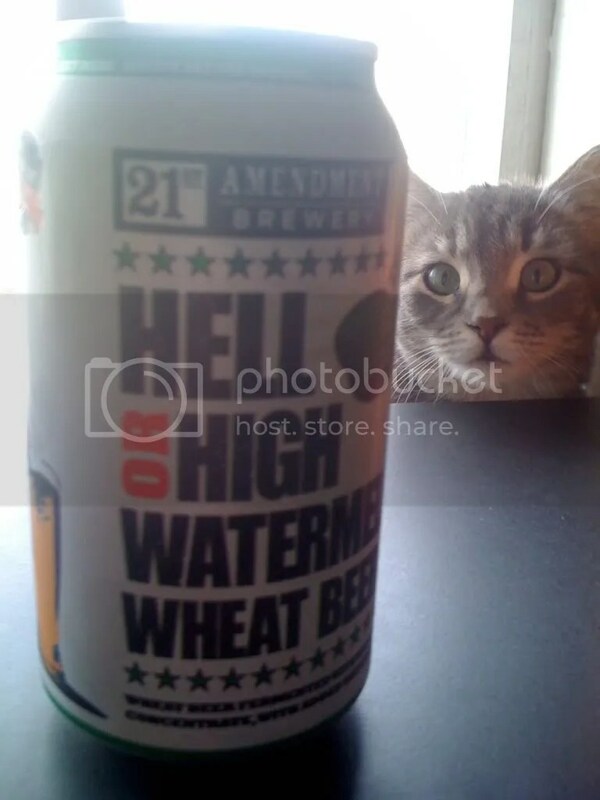 Hell or High Watermelon Wheat Beer from 21st Amendment Brewery was something that I just could not pass up. I can’t tell if it was the watermelon flavor or the fact the can spoke to me through its impressive designs and company’s mission statement. Whatever the reason was, it ended up in the basket. The can posed this beer to be simple in ingredients but shocking in originality. Both hold true from the weird combination of wheat and watermelon to the warning stating “Agitate before opening. Yeast inside”. Being the type of person who ignores words and warnings, I popped this can and drank it down as if it was a Bud Lite. Not a Bud Lite! The first thought I had, was eating a piece of watermelon and dropping it in a bag of day-old grass clippings. And then, instead of leaving the watermelon in the bag, you just pick it back up and keep on eating, rhine and all. It definitely is a wheaty, yeasty beer but after a few more sips, that taste subsides and a dry watermelon flavor permeates allowing the main attraction of this beer to be shown. I don’t know what I was expecting. Perhaps a Zima with a watermelon Jolly Rancher inside? No, but definitely not a medium body wheat. I love it for what it is; a cool concept in cooler packaging. Check them out here! 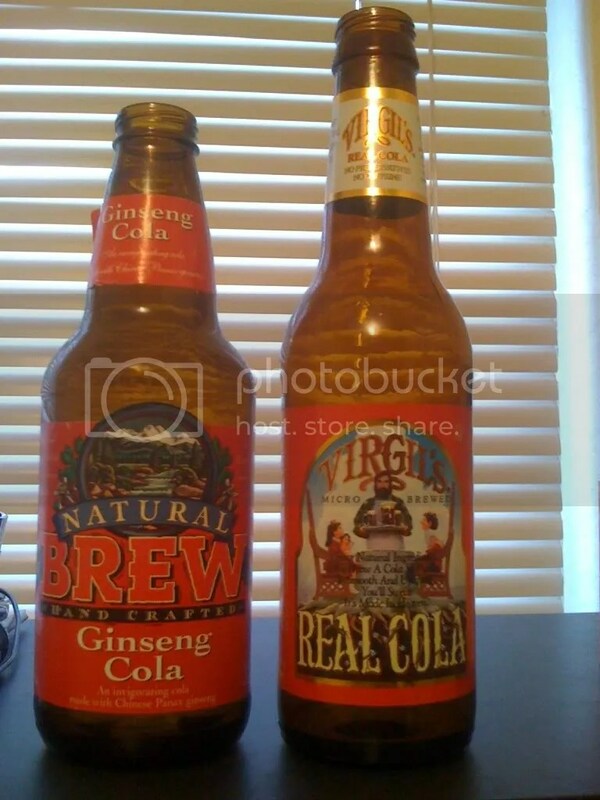 The following two are the colas that I needed to try. That is pretty much because the only three colas I have ever had were Coca Cola, Pepsi and R.C. and to me, each are only separated by a few varying degrees. I know the difference, but I am not the type to spit one over another out in protest. I needed to try the organic and micro brewed type just so I can really define what cola is. In the past, I have been let down by most anything cola flavored just because it all tastes like soda burp. Whether it is gum or candy, I leave it up to major corporations to tell me what real cola is supposed to taste like.The homemade version intrigue me. The one on the left is from the soda micro company Natural Brew and from the picture, its label seems to read “Band Crapter”. That can’t be right. Anyway, it’s defining feature is the Chinese ginseng root that promises sharper memory and motor skills. I don’t know. The taste however, was much like RC. No, it tastes exactly like RC. To the Royal Cola haters this might be a deal breaker but the ginsing…uh..”zing”, helped me learn French in a night. And I built a fort from the couch cushions, invited the neighbors and pelted them with rolled up socks. 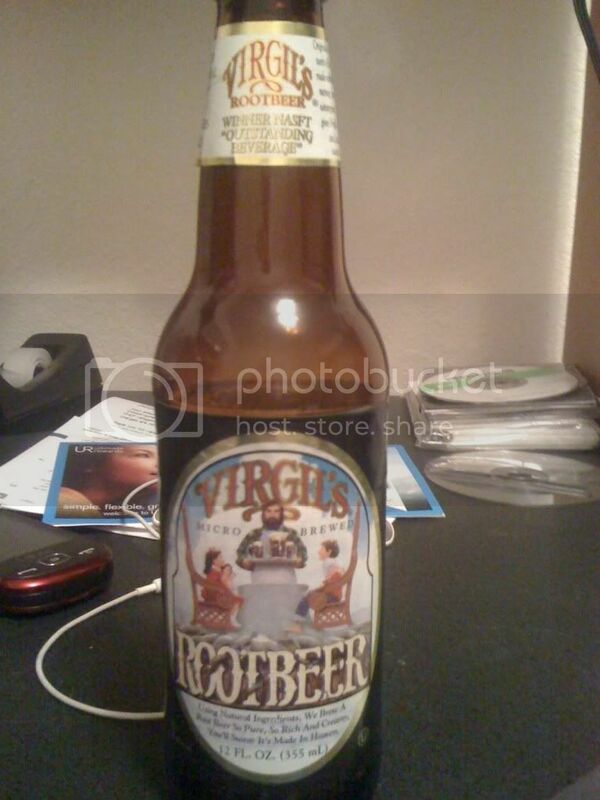 The cola to the right is from Virgil’s Micro Company and this one was a little more pleasing. Perhaps it’s the 64 grams of sugar? I have really become a fan of Virgil’s anything. The root beer is the greatest root beer you will ever have. While the cola is just like Coke, the root beer is like an acid trip to Candy Land by way of Chutes and Ladders. Unbelievable. If I had ten they would probably be consumed so fast I would slip into a diabetic furry of zombie-like coordination and absurd statements like “I lost my January” or “Beanie Babies for President! Four more days! Four more days!” It’s better if I just stick to one a week. Here is what I am talking about. This was perhaps the most in-congruent review I have ever done. I just needed an excuse to spend stupid money on stuff that economically sound folks would scoff at. I suppose that is why we have blogs. It is a great excuse to do most anything. I can’t tell you how many stupid things I have done, not because it was for the reasons of writing, but just because I wanted to do it. The blog only justifies my actions to others. In other news, I saw Trick r Treat finally. I liked it. Not so much for the quality of the movie but for what it was trying to do. 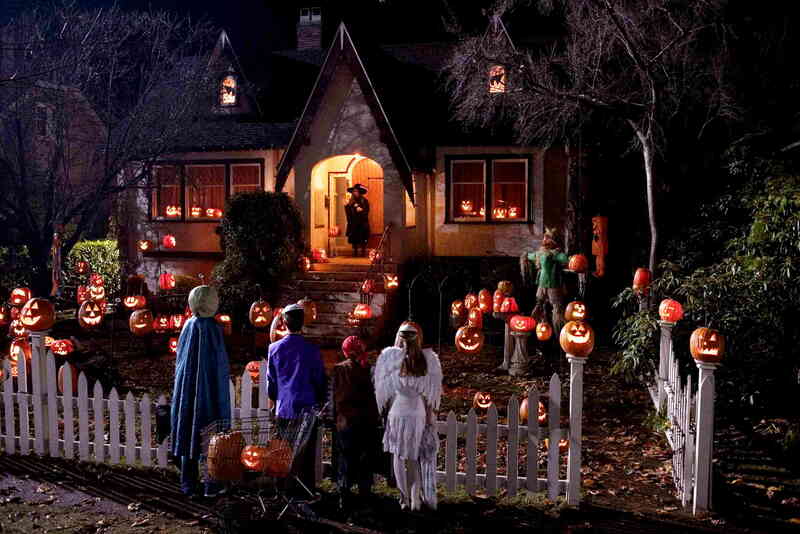 I loved The Creepshow feel and even more so, I absolutely loved the Halloweentown feel. Did I really just give props to a Disney movie and in the same sentence with The Creepshow while describing an R rated film? Bet your booberellas I did. If I keep going I might just throw a bone to Are You Afraid of the Dark from the ancient world of SNICK. If you guys have nothing going on tonight, check out Stacie Ponder’s relatively new radio show, The Scare-ening that is live at 8:00 Pacific. It’s a horror-fun-good-time. Great post! Lola’s expression is the best. By the way RC Cola is the best. I have not seen it around here for a while. It always reminds me of a backyard BBQ for some reason. I think it is because my parents were cheap and if the needed more than one bottle, the RC it was. Acid trip to Candy Land by way of Shoots and Ladders!! Lacey, you have been hiding your blog from me. Shame Shame. If Swazyee somehow met an unfortunate end and Lola is the look-alike cat you got to replace her, then I’m a shitheel who’s been out of the blog game too long and I sowwies. Hi! That is Swayzee. That is Lola’s middle name. Long story. Thank you so much for turning me on to Final Girl. Yeah, good stuff over there. Anyone with horror on the brain is a friend of mine.